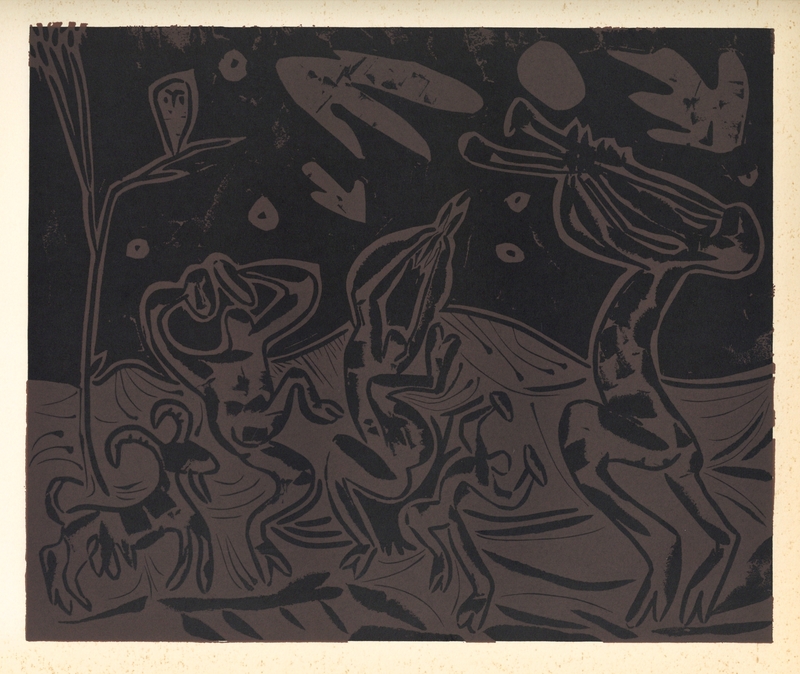 Pablo Picasso linocut "Bacchanal with Goat and Owl"
Medium: linocut re-creation (after the original Picasso linocut). Picasso started making linoleum cuts during the late 1950's and the originals were issued by Galerie Louise Leiris in signed editions of 50. 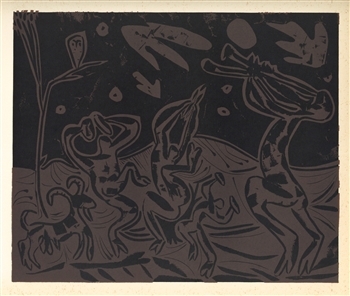 In 1962 Picasso and the Louise Leiris Gallery cooperated with the production of a facsimile edition of the linocuts, meticulously recreated in reduced size. The printing was done in West Germany, with a French edition published by Editions Cercle D'Art and an American edition published by Harry Abrams, both in 1962. In later years reprints were issued but the prints from the 1962 set are far superior in quality, having the look and feel of actual linocuts. This impression from the sought-after 1962 edition (published by Abrams) was done on heavy wove paper with a richly textured printed surface. The sheet measures 12 1/2 x 14 1/2 inches (318 x 365 mm) and the image size is 10 1/2 x 12 3/4 inches (270 x 325 mm). Not signed. Condition: there is foxing in the margins but the linocut image is good with strong, fresh color. The first photo is a close-up of the image; the second photo also shows some of the margins.